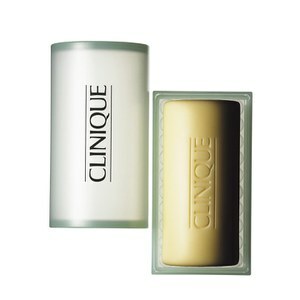 Treat your skin to the refreshing benefits of Clinique's Facial Soap Extra Mild, a hand-milled, non-drying bar of soap with handy soap dish. Suitable for all skin types, the soap effectively cleanses skin whilst maintaining protective lipids and swiping away dead skin cells. Skin feels clean and fresh with no feelings of tightness, and is fully prepped for exfoliation. - K.N. Usare le mani per emulsionare il Facial Soap su viso e collo struccati. Sciacquare bene con acqua tiepida. Proseguire con la fase 2 e 3: la Clarifying Lotion appropriata per il proprio tipo di pelle e Dramatically Different Moisturizing Lotion o Gel.